The National Highway Traffic Safety Administration has a standard for roof strength which requires all vehicles under 6,000 pounds to have a roof strength that is able to carry at least one and a half times the vehicle's weight in the event of a rollover. Unfortunately, the vehicles most likely to rollover – SUVs, vans, and trucks, are typically over 6,000 pounds, meaning they are not held to this same standard. 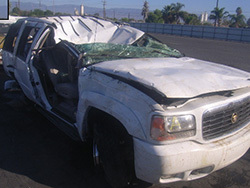 Poor or defective roof materials are major contributors to rollover injuries and fatalities. When roof tops and roof pillars do not have adequate materials, the possibility of a roof crush accident is much greater. If you or someone you love was harmed due to a rollover that resulted in the roof collapsing, the Willis Law Firm can help you seek the compensation you need. For more information on how our firm can help you to hold a manufacturer accountable for using defective roof materials, contact our offices today at 800-883-9858. If you or a loved one was injured in a rollover accident that involved the roof crushing in on the occupants, the Willis Law Firm may be able to help you to recover compensation from the vehicle's manufacturer. To speak with a skilled legal professional, contact us by calling 800-883-9858 today.